Welcome to the fourth part of the “Hypervisor From Scratch”. 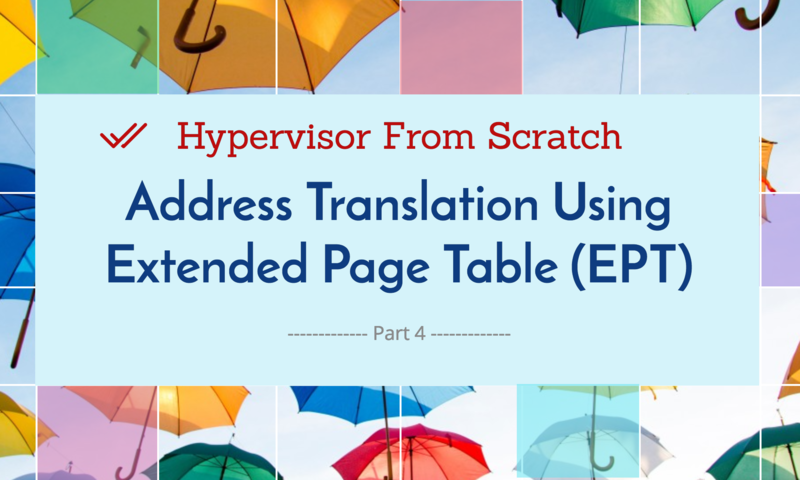 This part is primarily about translating guest address through Extended Page Table (EPT) and its implementation. We also see how shadow tables work and other cool stuff. First of all, make sure to read the earlier parts before reading this topic as these parts are really dependent on each other also you should have a basic understanding of paging mechanism and how page tables work. A good article is here for paging tables. Most of this topic derived from Chapter 28 – (VMX SUPPORT FOR ADDRESS TRANSLATION) available at Intel 64 and IA-32 architectures software developer’s manual combined volumes 3. Before starting, I should give my thanks to Petr Beneš, as this part would never be completed without his help. Second Level Address Translation (SLAT) or nested paging, is an extended layer in the paging mechanism that is used to map hardware-based virtualization virtual addresses into the physical memory. AMD implemented SLAT through the Rapid Virtualization Indexing (RVI) technology known as Nested Page Tables (NPT) since the introduction of its third-generation Opteron processors and microarchitecture code name Barcelona. Intel also implemented SLAT in Intel® VT-x technologiessince the introduction of microarchitecture code name Nehalem and its known as Extended Page Table (EPT) and is used in Core i9, Core i7, Core i5, and Core i3 processors. ARM processors also have some kind of implementation known as known as Stage-2 page-tables. There are two methods, the first one is Shadow Page Tables and the second one is Extended Page Tables. Shadow page tables are used by the hypervisor to keep track of the state of physical memory in which the guest thinks that it has access to physical memory but in the real world, the hardware prevents it to access hardware memory otherwise it will control the host and it is not what it intended to be. In this case, VMM maintains shadow page tables that map guest-virtual pages directly to machine pages and any guest modifications to V->P tables synced to VMM V->M shadow page tables. By the way, using Shadow Page Table is not recommended today as always lead to VMM traps (which result in a vast amount of VM-Exits) and losses the performance due to the TLB flush on every switch and another caveat is that there is a memory overhead due to shadow copying of guest page tables. To reduce the complexity of Shadow Page Tables and avoiding the excessive vm-exits and reducing the number of TLB flushes, EPT, a hardware-assisted paging strategy implemented to increase the performance. According to a VMware evaluation paper: “EPT provides performance gains of up to 48% for MMU-intensive benchmarks and up to 600% for MMU-intensive microbenchmarks”. EPT implemented one more page table hierarchy, to map Guest-Virtual Address to Guest-Physical address which is valid in the main memory. One page table is maintained by guest OS, which is used to generate the guest-physical address. The other page table is maintained by VMM, which is used to map guest physical address to host physical address. so for each memory access operation, EPT MMU directly gets the guest physical address from the guest page table and then gets the host physical address by the VMM mapping table automatically. If you want to see whether your system supports EPT on Intel processor or NPT on AMD processor without using assembly (CPUID), you can download coreinfo.exe from Sysinternals, then run it. The last line will show you if your processor supports EPT or NPT. EPT defines a layer of address translation that augments the translation of linear addresses. The extended page-table mechanism (EPT) is a feature that can be used to support the virtualization of physical memory. When EPT is in use, certain addresses that would normally be treated as physical addresses (and used to access memory) are instead treated as guest-physical addresses. Guest-physical addresses are translated by traversing a set of EPT paging structures to produce physical addresses that are used to access memory. EPT is used when the “enable EPT” VM-execution control is 1. It translates the guest-physical addresses used in VMX non-root operation and those used by VM entry for event injection. EPT translation is exactly like regular paging translation but with some minor differences. In paging, the processor translates Virtual Address to Physical Address while in EPT translation you want to translate a Guest Virtual Address to Host Physical Address. If you’re familiar with paging, the 3rd control register (CR3) is the base address of PML4 Table (in an x64 processor or more generally it points to root paging directory), in EPT guest is not aware of EPT Translation so it has CR3 too but this CR3 is used to convert Guest Virtual Address to Guest Physical Address, whenever you find your target Guest Physical Address, it’s EPT mechanism that treats your Guest Physical Address like a virtual address and the EPTP is the CR3. Just think about the above sentence one more time! So your target physical address should be divided into 4 part, the first 9 bits points to EPT PML4E (note that PML4 base address is in EPTP), the second 9 bits point the EPT PDPT Entry (the base address of PDPT comes from EPT PML4E), the third 9 bits point to EPT PD Entry (the base address of PD comes from EPT PDPTE) and the last 9 bit of the guest physical address point to an entry in EPT PT table (the base address of PT comes form EPT PDE) and now the EPT PT Entry points to the host physical address of the corresponding page. You might ask, as a simple Virtual to Physical Address translation involves accessing 4 physical address, so what happens ?! The answer is the processor internally translates all tables physical address one by one, that’s why paging and accessing memory in a guest software is slower than regular address translation. The following picture illustrates the operations for a Guest Virtual Address to Host Physical Address. Bits 31:22 of the linear address select an entry in the guest page directory located at the guest-physical address in CR3. The guest-physical address of the guest page-directory entry (PDE) is translated through EPT to determine the guest PDE’s physical address. Bits 21:12 of the linear address select an entry in the guest page table located at the guest-physical address in the guest PDE. The guest-physical address of the guest page-table entry (PTE) is translated through EPT to determine the guest PTE’s physical address. Bits 11:0 of the linear address is the offset in the page frame located at the guest-physical address in the guest PTE. The guest physical address determined by this offset is translated through EPT to determine the physical address to which the original linear address translates. Note that PAE stands for Physical Address Extension which is a memory management feature for the x86 architecture that extends the address space and PSE stands for Page Size Extension that refers to a feature of x86 processors that allows for pages larger than the traditional 4 KiB size. In addition to translating a guest-physical address to a host physical address, EPT specifies the privileges that software is allowed when accessing the address. Attempts at disallowed accesses are called EPT violations and cause VM-exits. Keep in mind that address never translates through EPT, when there is no access. That your guest-physical address is never used until there is access (Read or Write) to that location in memory. Now that we know some basics, let’s implement what we’ve learned before. Based on Intel manual we should write (VMWRITE) EPTP or Extended-Page-Table Pointer to the VMCS. The EPTP structure described below. Each entry in all EPT tables is 64 bit long. EPT PML4E and EPT PDPTE and EPT PD are the same but EPT PTE has some minor differences. Ok, Now we should implement tables and the first table is PML4. The following table shows the format of an EPT PML4 Entry (PML4E). The last page is EPT which is described below. Note that you have, EPTMemoryType, IgnorePAT, DirtyFlag and SuppressVE in addition to the above pages. There are other types of implementing page walks ( 2 or 3 level paging) and if you set the 7th bit of PDPTE (Maps 1 GB) or the 7th bit of PDE (Maps 2 MB) so instead of implementing 4 level paging (like what we want to do for the rest of the topic) you set those bits but keep in mind that the corresponding tables are different. These tables described in (Table 28-4. Format of an EPT Page-Directory Entry (PDE) that Maps a 2-MByte Page) and (Table 28-2. Format of an EPT Page-Directory-Pointer-Table Entry (PDPTE) that Maps a 1-GByte Page). Alex Ionescu’s SimpleVisor is an example of implementing in this way. An important note is almost all the above structures have a 36-bit Physical Address which means our hypervisor supports only 4-level paging. It is because every page table (and every EPT Page Table) consist of 512 entries which means you need 9 bits to select an entry and as long as we have 4 level tables, we can’t use more than 36 (4 * 9) bits. Another method with wider address range is not implemented in all major OS like Windows or Linux. I’ll describe EPT PML5E briefly later in this topic but we don’t implement it in our hypervisor as it’s not popular yet! By the way, N is the physical-address width supported by the processor. CPUID with 80000008H in EAX gives you the supported width in EAX bits 7:0. Let’s see the rest of the code, the following code is the Initialize_EPTP function which is responsible for allocating and mapping EPTP. Note that the PAGED_CODE() macro ensures that the calling thread is running at an IRQL that is low enough to permit paging. First of all, allocating EPTP and put zeros on it. Now, we need a blank page for our EPT PML4 Table. And another empty page for PDPT. Of course its true about Page Directory Table. The last table is a blank page for EPT Page Table. Now that we have all of our pages available, let’s allocate two page (2*4096) continuously because we need one of the pages for our RIP to start and one page for our Stack (RSP). After that, we need two EPT Page Table Entries (PTEs) with permission to execute, read, write. The physical address should be divided by 4096 (PAGE_SIZE) because if we dived a hex number by 4096 (0x1000) 12 digits from the right (which are zeros) will disappear and these 12 digits are for choosing between 4096 bytes. By the way, we let stack be executable too and that’s because, in a regular VM, we should put RWX to all pages because its the responsibility of internal page tables to set or clear NX bit. We need to change them from EPT Tables for special purposes (e.g intercepting instruction fetch for a special page). Changing from EPT tables will lead to EPT-Violation, in this way we can intercept these events. The actual need is two page but we need to build page tables inside our guest software thus we allocate up to 10 page. I’ll explain about intercepting pages from EPT, later in these series. Note: EPTMemoryType can be either 0 (for uncached memory) or 6 (write-back) memory and as we want our memory to be cacheable so put 6 on it. The next table is PDE. PDE should point to PTE base address so we just put the address of the first entry from the EPT PTE as the physical address for Page Directory Entry. Next step is mapping PDPT. PDPT Entry should point to the first entry of Page-Directory. The last step is configuring PML4E which points to the first entry of the PTPT. We’ve almost done! Just set up the EPTP for our VMCS by putting 0x6 as the memory type (which is write-back) and we walk 4 times so the page walk length is 4-1=3 and PML4 address is the physical address of the first entry in the PML4 table. I’ll explain about DirtyAndAcessEnabled field later in this topic. All the above page tables should be aligned to 4KByte boundaries but as long as we allocate >= PAGE_SIZE (One PFN record) so it’s automatically 4kb-aligned. In EPTP, you’ll decide whether enable accessed and dirty flags for EPT or not using the 6th bit of the extended-page-table pointer (EPTP). Setting this flag causes processor accesses to guest paging structure entries to be treated as writes. For any EPT paging-structure entry that is used during guest-physical-address translation, bit 8 is the accessed flag. For an EPT paging-structure entry that maps a page (as opposed to referencing another EPT paging structure), bit 9 is the dirty flag. Whenever the processor uses an EPT paging-structure entry as part of the guest-physical-address translation, it sets the accessed flag in that entry (if it is not already set). Whenever there is a write to a guest-physical address, the processor sets the dirty flag (if it is not already set) in the EPT paging-structure entry that identifies the final physical address for the guest-physical address (either an EPT PTE or an EPT paging-structure entry in which bit 7 is 1). These flags are “sticky,” meaning that, once set, the processor does not clear them; only software can clear them. addresses. None of the modern OSs use this feature yet. PML5 is also applying to both EPT and regular paging mechanism. Translation begins by identifying a 4-KByte naturally aligned EPT PML5 table. It is located at the physical address specified in bits 51:12 of EPTP. An EPT PML5 table comprises 512 64-bit entries (EPT PML5Es). An EPT PML5E is selected using the physical address defined as follows. Bits 63:52 are all 0. Bits 51:12 are from EPTP. Bits 11:3 are bits 56:48 of the guest-physical address. Bits 2:0 are all 0. Because an EPT PML5E is identified using bits 56:48 of the guest-physical address, it controls access to a 256-TByte region of the linear address space. The only difference is you should put PML5 physical address instead of the PML4 address in EPTP. For more information about 5-layer paging take a look at this Intel documentation. INVEPT – Invalidate cached Extended Page Table (EPT) mappings in the processor to synchronize address translation in virtual machines with memory-resident EPT pages. INVVPID – Invalidate cached mappings of address translation based on the Virtual Processor ID (VPID). Imagine we access guest-physical-address 0x1000,it’ll get translated to host-physical-address 0x5000. Next time, if we access 0x1000, the CPU won’t send the request to the memory bus but uses cached memory instead. it’s faster. Now let’s say we change EPT_PDPT->PhysicalAddress to point to different EPT PD or change the attributes of one of the EPT tables, now we have to tell the processor that your cache is invalid and that’s what exactly INVEPT performs. Now we have two terms here, Single-Context and All-Context. Single-Context means, that you invalidate all EPT-derived translations based on a single EPTP (in short: for single VM). All-Context means that you invalidate all EPT-derived translations. (for every-VM). So in case if you wouldn’t perform INVEPT after changing EPT’s structures, you would be risking that the CPU would reuse old translations. Basically, any change to EPT structure needs INVEPT but switching EPT (or VMCS) doesn’t need INVEPT because that translation will be “tagged” with the changed EPTP in the cache. The following assembly function is responsible for INVEPT. Note that VMX_ERROR_CODE_FAILED_WITH_STATUS and VMX_ERROR_CODE_FAILED define like this. To invalidate all the contexts use the following function. And the last step is for Single-Context INVEPT which needs an EPTP. Using the above functions in a modification state, tell the processor to invalidate its cache. In this part, we see how to initialize the Extended Page Table and map guest physical address to host physical address then we build the EPTP based on the allocated addresses. The future part would be about building the VMCS and implementing other VMX instructions. Don’t forget to check the blog for the future posts.